Here’s the thing with kid shoes: you can look at the and think, “Oh, those are nice!” You can have your kids walk around in them and ask them, “do those feel comfortable?” You can have the shoe attendant measure their foot, and you can press on their big toes when they’re standing up to see if the shoe fits. But no matter how many different ways you have of testing the fit, you’ll never really know for sure if the shoe is the RIGHT fit for your child. Which, for many parents, is concerning: after al, your child will be wearing these shoes all year. 1) Children’s shoe sizes change with age. Children’s feet grow just as quickly as they do, so when shopping for shoes and socks for them, keep in mind that what they were wearing in September may not be what they’re wearing in December. 2) Ill fitting shoes cause ill-feeling feet. Think of how you feel when your shoes are too big or too small—uncomfortable, right? 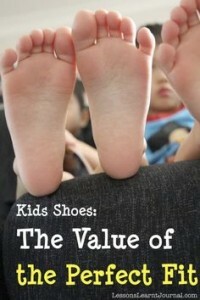 Your child feels the same, so always be sure to have their feet measured before trying on shoes. If your child shoes signs of irritation – even if they don’t want to admit it – don’t buy the shoe, or opt for a different size. 3) Shoes should not be handed down. Just because the 9 ½ fit your first child comfortably does not mean they’ll fit your second child the same way when they’re in the same size. Also, shoes form to feet, and a worn shoe is going to be shaped to the previous owner’s foot and be highly uncomfortable for the second owner. Last but not least, sharing shoes is a surefire way to spread fungi like athlete’s foot and nail fungus. 4) Check the heels. Many children wear through the heels of their shoes quicker than any other part of them. If this is the case, it’s time for a new pair. Uneven heel wear can indicate a foot problem that should be checked out by a podiatrist. There are special shoes for this, so if your child tends to wear out their heels quickly, ask the store clerk if they have anything specific in stock for this condition. 5) Always buy for the larger foot. Everyone’s feet are different sizes, even if they’re off by less than a millimeter. Always buy for the larger foot, as a too small shoe can get extremely uncomfortable. 6) Don’t buy shoes that need a break in period. Shoes should be comfortable upon first wear, not a month after you buy them. Also, they should be comfortable with socks, if that’s what they’ll wear them with, so make sure when they try them on, you take that into consideration. 7) Take your child with you. I know – many parents don’t like to take their child shopping with them, especially when they’re buying anything but toys. But because every shoe fits differently, it’s important that your child is there to wear them around and tell you how they feel in them. With Stikii Shoes, the shoe buying process can be fun and easy. Just visit us at www.stikii.com to see why!